We love a kitchen gadget. We also love our fruit and herbs, and we also love our drinks. In fact, we love a lot of things that revolve around the kitchen. 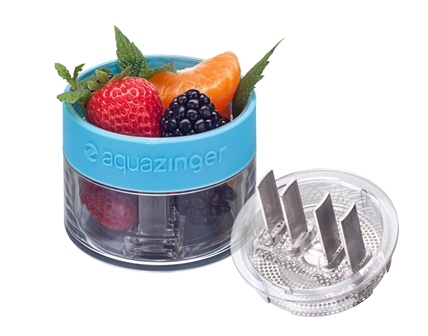 The Aqua Zinger seems to hone in on all of that by giving us a device that lets you infuse your water (both cold or warm) with various fruits, herbs or vegetables. You add your elements to the bottom, and as you twist on the bottle, they get crushed and juiced into the vessel. Add water, give it a shake, and you’re good to go. 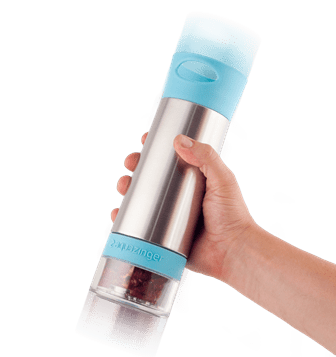 The Salad Zinger is not that far off from the Aua Zinger, apart from the fact that the bottom cup is more of a grinder than a juicer, and the top comes with a ready to pour a dressing top instead of the waterproof carry anywhere top with the Aqua Zinger. On a cursory glance, both look like normal things you’d find in a kitchen. Perhaps a Thermos? However, closer inspection reveals that both come in two parts. The bottom twists off, and the twist action plays a big part in how these both work. In the bottom cup, you place your vegetables, herbs, and whatever you fancy to go in your water or your salad/dressing. On top goes the blades/grinder element that fits into the top section, and twists against the bottom as you screw it on. The top part is fairly normal in comparison, which acts as a vessel for your hot/cold water or salad/oil. 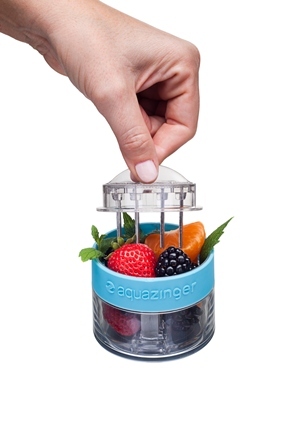 The Aqua Zinger itself has a great finish, both the metal and the plastic bit. The metal has a beautiful steel finish, while the plastic element provides a good grip and a soft feel. The top of the bottle has holes to help you carry it, and once twisted on, it is designed to keep hot drinks warm, and cold drinks cold. It also provides a good seal so you don’t have to worry about leakage if you carry this with you. The Salad Zinger is made of plastic, though looks like glass. While the bottom is more or less the same as the Aqua Zinger, the top is shaped more like a dressing/oil pourer, with the thin neck and a twisting neck. The plastic is once again a good finish and nice to touch, though of course this one isn’t designed to be carried in your back pack. The usage is quite simple for both. Add your elements to the bottom cup, making sure there are no pips, or hard or tough parts in there. The idea is to completely fill the cup, so that the blades can give you their full potential. Refit the grinder blades to the cup, and then screw the cup back on to the bottom of the bottle. As the bottle screws in, the grinder blades work to get the best out of your ingredients. It is recommended to unscrew and repeat the action for best output. Once happy with that, just pour the liquid of your choice on top, and give it a good shake. Very actually. 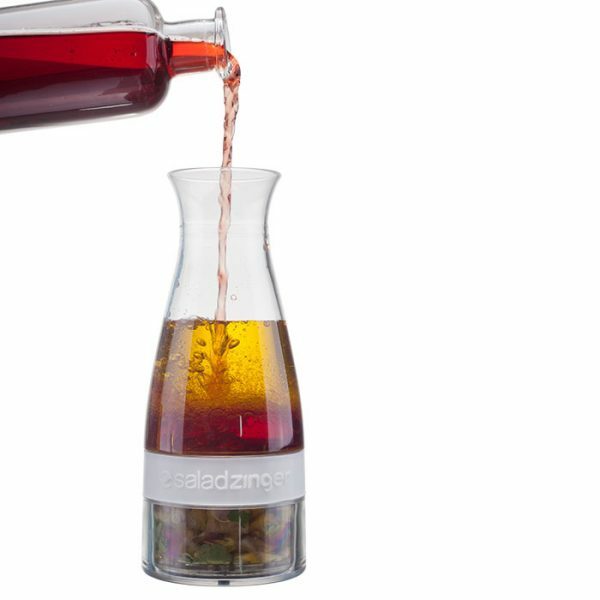 From making lemonade with that added mint to fusion teas, from giving your vinegar some proper herbs to actually making chilly oil, these two provided us with an easy way to get the most out with the least effort. There is something magical about something that is so simple, and yet so effective. We really like both of these, and they proudly sit on our kitchen shelf, ready to be used as much as possible.